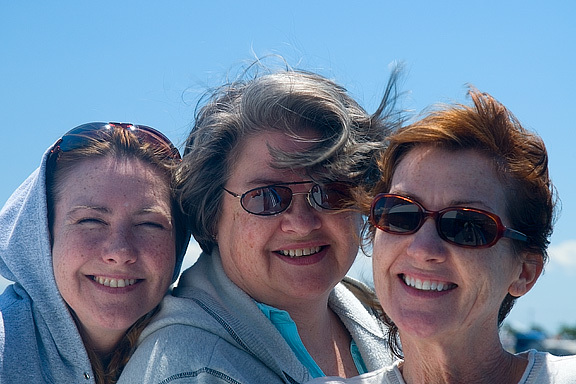 While	we	were all	together	in Maryland, my family went on a little cruise to Smith Island, a tiny dot of land in the Chesapeake Bay. 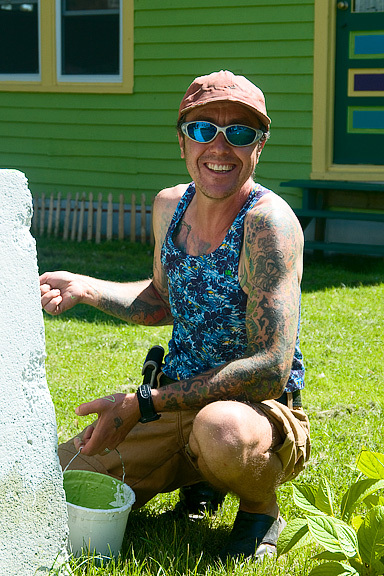 On a previous trip, I visited Tangiers Island — there are similarities but differences as well. 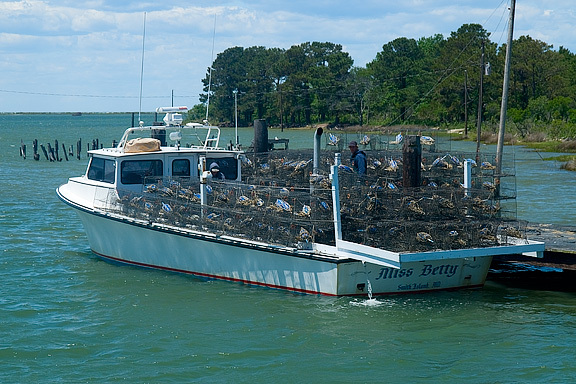 Both reflect an older style of life on the Chesapeake Bay — hard-working folks harvesting the natural resources that Mother Nature has so generously provided. Unfortunately, due to overfishing and pollution of the Bay, it has gotten harder and harder for these folks to earn a living. Kids grow up and leave for employent on "the mainland". And the islands are sinking — to be further threatened by the rising sea level as the planet warms. 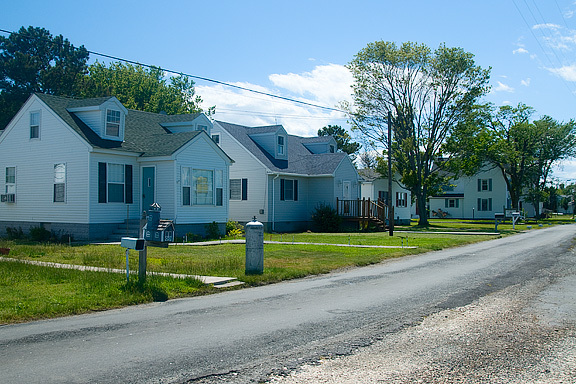 We headed out from Crisfield, enjoying the views and the cooling breeze. Off to the starboard, we viewed some ruins — the remains of an old fish canning factory. Only the chimney remains standing. 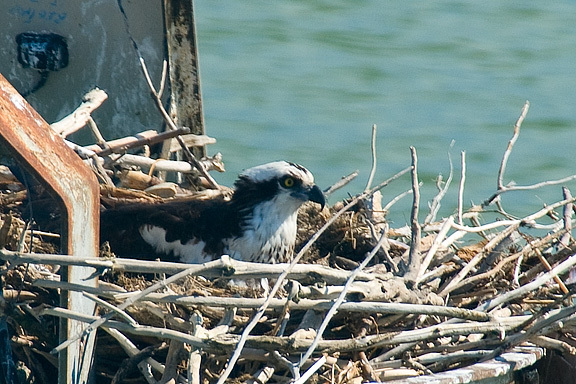 Off to port,	we	spotted	an	Ospry's nest with a young one still in residence. It looks like it is almost ready to begin testing those wings. 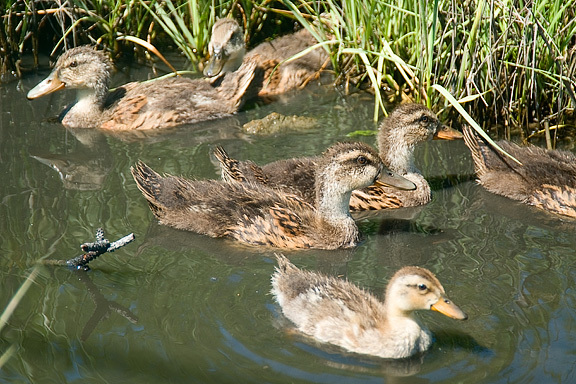 Of course, Ospry are large birds and the size of a juvenile may be deceiving — it is still demanding feeding from the parents. I suspect it may just be like a human teenager — who is not quite ready to get that first job and move out from mom and dad's place. 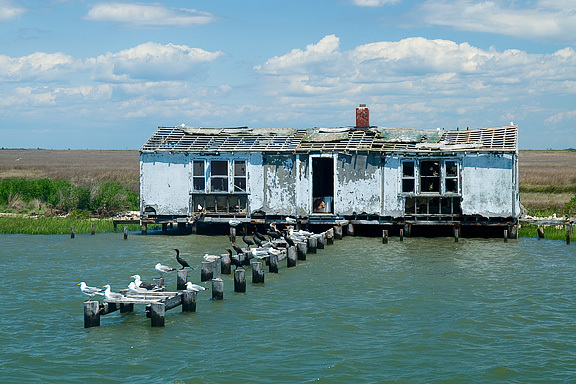 As we approach Smith Island, we saw abandoned	remnants	of the old way of life. Perhaps we tend to romanticize it, but I tend to think that living here might have been quite pleasant at one time. Except for the mosquitos. And the storms. And the hot summer sun. And the cold winter snows. Yes, must have been nice. The ride over is about an hour — and finally we approached the harbor. 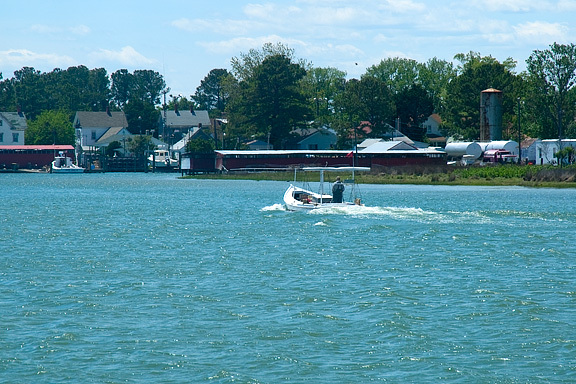 The skipper slowed down and granted the right of way to this fisherman in the smaller boat. But we can now see that there really are signs of human habitation on this remote spot. 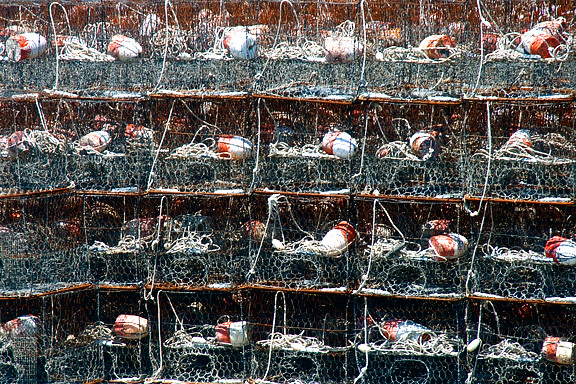 Crab pots! And	lots	of	them. Piled high on the docks. And filling the	working	boats. I mentioned that times are hard for these crab fishermen. 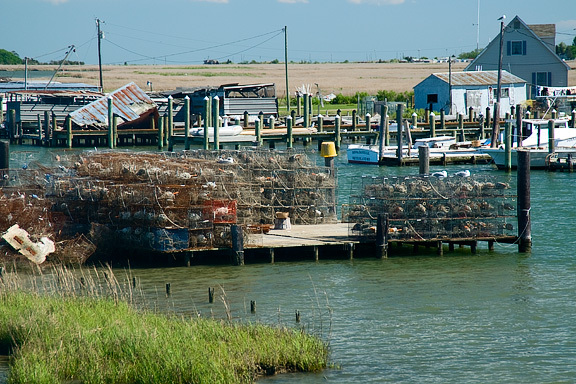 While I was in Maryland, I read in the newspaper about one Virginia crab fisherman who was now harvesting crabs from the Atlantic Ocean. It is a different species which has not been overfished so far. His biggest challenge was convincing folks to buy this new, unfamiliar variety of crab. The ride over stimulated our appetites — we were starving. 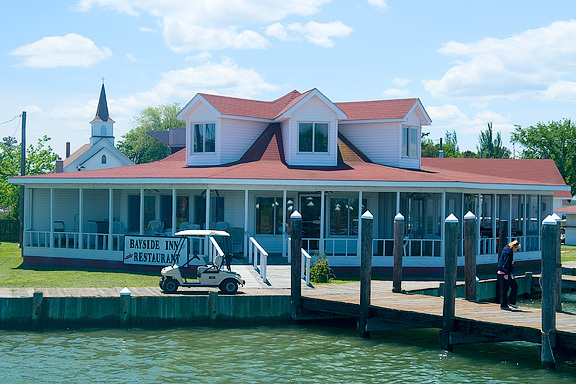 Conveniently, there is a restaurant right at the dock. We sat down at a big round table and were served a wonderful family-style meal. We had crab cakes, of course, and they were wonderful — but one dish caught my notice — one which I do not believe I have ever had before — corn pudding. Sounds weird but it was very good. The only disappointment was that we were expecting Smith Island cake for dessert and were served a custard pie. Nothing wrong with the pie but I really wanted to try the namesake dessert. This cake consists of some 8 to 10 layers, with icing in between. The layers are thin — resulting in a cake that some people describe as more icing than cake. Perhaps too sweet but you gotta try it once in your life. 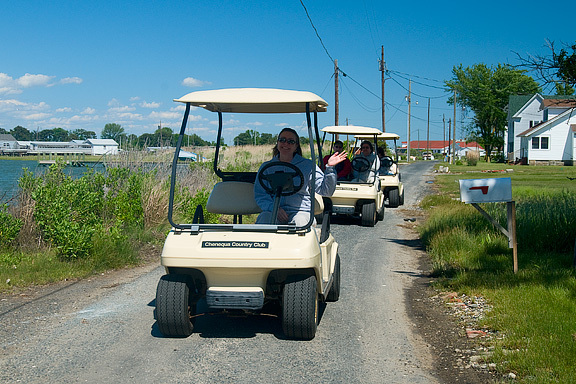 drive golf carts. We rented these at the restaurant. 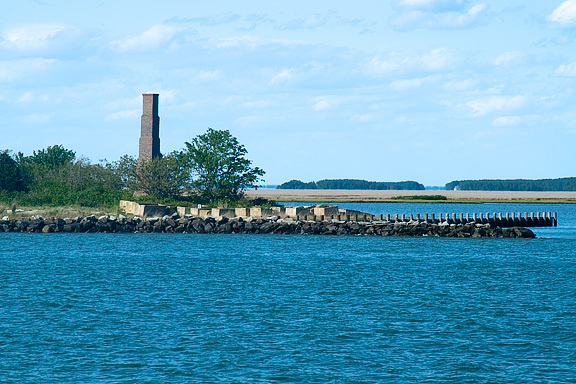 Typical tourist trap — we felt ripped off — but how many times are you going to visit Smith Island? We only had an hour and a half for touring and with the golf carts, we were able to visit the entire island, twice. 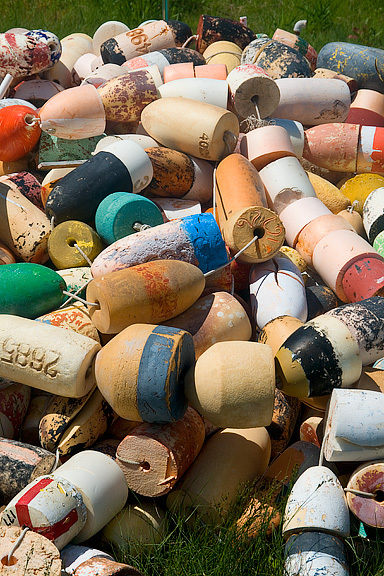 More evidence of the traditional life on the Bay — colorful floats. 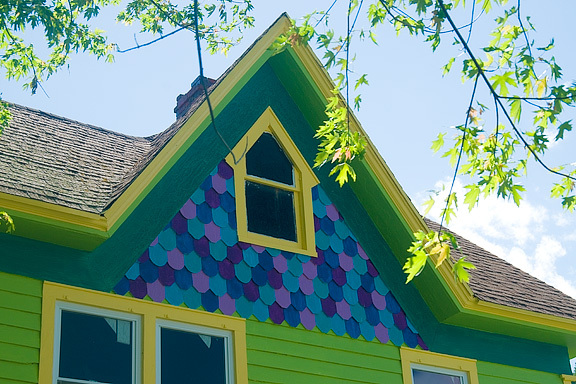 Later, we found another artist's home — where he (she?) had works of art decorating the yard. 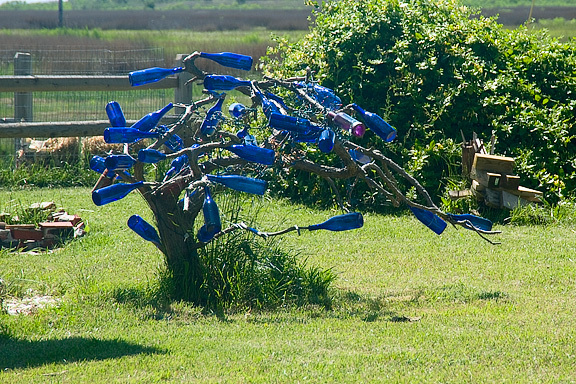 A bottle tree? I have never seen one before. First time for everything. As we continued our tour, we encountered some non-human residents of Smith Island. I suspect their kind will be here long after the humans have left this sinking island. Why is that the young of most species are so cute? True with humans. True with ducks.